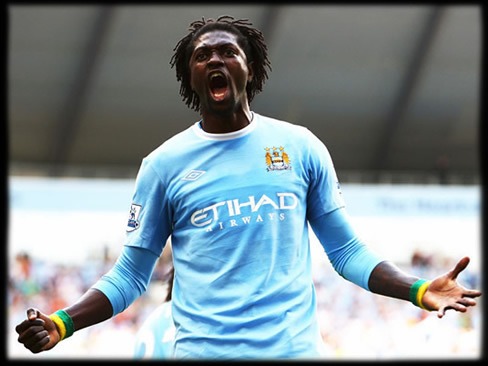 Real Madrid just signed with Emmanuel Adebayor, from Manchester City. The player comes on loan until the end of the season, with an option for Real Madrid to buy him in the summer for an agreed fee of 20,8 million euros. You can read the official statement from Real Madrid's website here. José Mourinho has been left short of attacking options after the loss of Gonzalo Higuain, who is set to miss the majority of the remainder of the current La Liga campaign as well as the Champions League, due to a serious injury. The lack of confidence on Karim Benzema seems evident, and, therefore, Adebayor arrives with hopes of becoming a first choice for the team, in a matter of weeks. Adebayor has found first team opportunities hard to come over Manchester City during this season and has fallen further down the pecking order following the arrival of Edin Dzeko from Wolfsburg. However, he still managed to score five goals in 12 games for the english side. The Togolese forward will have a medical in Madrid this wednesday, and Real Madrid will reportedly have to pay £18 million (pounds) to make the deal permanent at the end of this season. Adebayor got very popular for his great performances for Arsenal, back in 2007 and 2008, and if he show that sort of brilliance in the "Bernabéu", he'll be a very serious menace to all Real Madrid's opponents. Adebayor biggest weapons are his speed and goal instinct, curiously, two qualities that Benzema seems to lack.